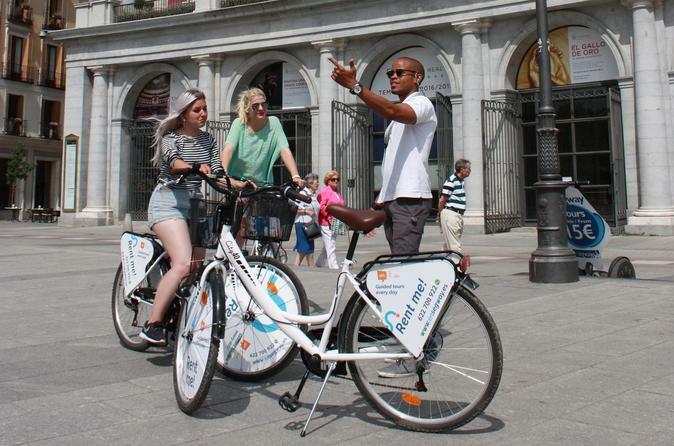 The Bike tours offered by Ensegway Madrid are the perfect combination of fun, culture and, above all, our passion for cycling. A magnificent walk of around 10-15 kilometers in which we can visit the Retiro Park, one of the main lungs of the Spanish capital, and we will visit the area of Madrid Rio, reaching the historic Templo de Debod. A route that allows us to do some healthy exercise while we enjoy the beautiful green areas of the city. • Fun, dynamic and cultural experience. • Professional, friendly guide who transmits his knowledge and passion for Madrid. • Personalized and customized visits. • Healthy means of transport and respectful of the environment. Our Premium bike tour of 2 hours departs from the Ensegway Madrid office at Street Union number 4, near the Opera Underground station, in the city center. This tour is a magnificent bike ride of around 10-15 kilometers in which we can visit the Retiro Park, one of the main lungs of the Spanish capital, and we will visit the area of Madrid Rio, reaching the historic Templo de Debod. A route that allows us to do some healthy exercise while we enjoy the beautiful green areas of the city.